Make your own water filter capable of removing dirt, heavy metals and chemicals! Example: Does changing the arrangement of the layers affect how quickly the water is filtered? 1 hole per “bump” on the bottom of the bottle works well. Layer 10-15 cotton balls in the bottom of each bottle. Pull them slightly apart, then use the skewer or stick to smush them down into all of the bumps in the bottom of the bottle. The cotton needs to cover the entire bottom of the bottle to keep the sand from coming out. Use one cloth circle or coffee filter to cover the cotton balls. Getting the cloth or filter in the bottle and then over the cotton can be tricky. You could ask an adult to cut the spout off your bottle so you have a larger opening to work with. A sand layer of about 7cm or 2 ½ inches deep is recommended. Then it’s up to your scientist! Experiment by adding additional layers. 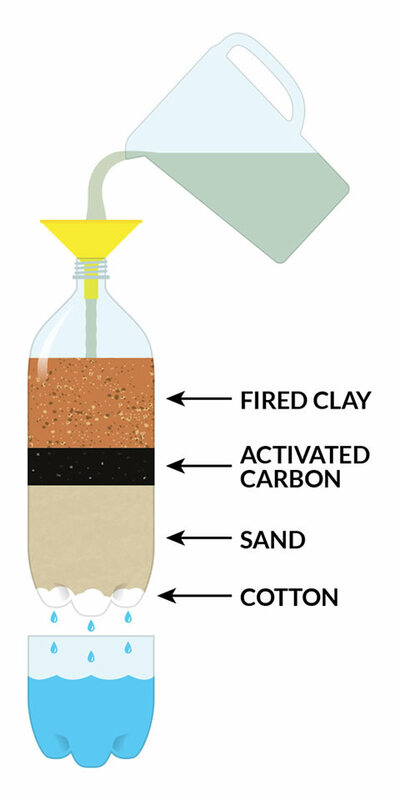 You could make one filter using the charcoal, make another one using the fired clay, or make one filter that uses both, or make one with just sand - experiment! Place a cup under your filter to catch the filtered water. Place the small end of the funnel in the top of the bottle and pour about 1.5 cups of the dirty water into the top of your filter. Wait several minutes for the water to filter through. The water should drip SLOWLY out of the bottom of the filter. See how many times you need to pour the water through your filter(s) until it becomes clear. Make a chart to track which filter works best. Filter the water enough times until it looks clean. Why is it important we only drink clean water? Safe, clean, drinking water is essential for human life. Diseases can live in water and make people very, very sick. Is the water that comes into your house filtered? The U.S. relies on public water systems to treat and deliver billions of gallons of clean water each day. Much of this water comes from rivers, lakes and other surface water sources. Before it is delivered to homes, it is treated to remove chemicals, dirt, and bacteria. This clean water is then used for cooking, drinking, cleaning, and bathing. Contact your local water authority to find out more about how the water your house receives is cleaned. Does the order of the layers matter? Activated charcoal is carbon that has been treated with oxygen at very high temperatures. The oxygen eats away at the carbon and makes all kinds of tunnels and pores. As water passes through this porous charcoal, the little particles and impurities get trapped inside the charcoal. “Activated” means it has a slightly positive charge and works like a magnet on negatively charged impurities that are attracted and bind to the outside of the charcoal. Point to ponder: What if you had to filter all of the water you use each day? Some people around the world have to! As you saw with this experiment, filtering dirty water to make it clean enough to drink takes time and effort. It is very important to save the water we use every day and not waste it. What are some ways you can conserve water every day? The different layers of the filter help to pull the dirty particles out of the water. The cotton ball layer helps to keep the other layers of your filter from falling out into your water. The sand layer acts as a coarse filter for large muddy particles and to keep the activated charcoal or clay particles from getting into the cleaned water. The fired ceramic clay attracts metallic ions and is good for attracting and filtering out metallic particles. The activated charcoal layer is amazing at trapping the impurities in its network of holes and tunnels. Activated charcoal is carbon that has been treated with oxygen at very high temperatures. The oxygen eats away at the carbon and makes all kinds of tunnels and pores. Just three grams of activated charcoal can have as much surface area as a football field! As water passes through this porous charcoal, the little particles and impurities get trapped inside the charcoal. 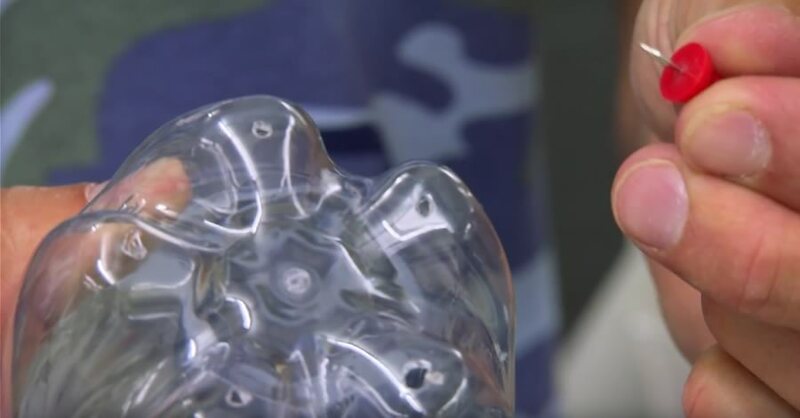 “Activated” means it has a slightly positive charge and works like a magnet on negatively charged impurities that are attracted and bind to the outside of the charcoal. Did you know that 75% of the earth’s surface is covered by water? Most of it is salt water and can’t be used for drinking. In fact, less than 1% of the earth’s water can be used by people! As you saw with this experiment, filtering dirty water to make it clean enough to drink takes time and effort. It is very important to save the water we use every day and not waste it. What are some ways you can conserve water every day?